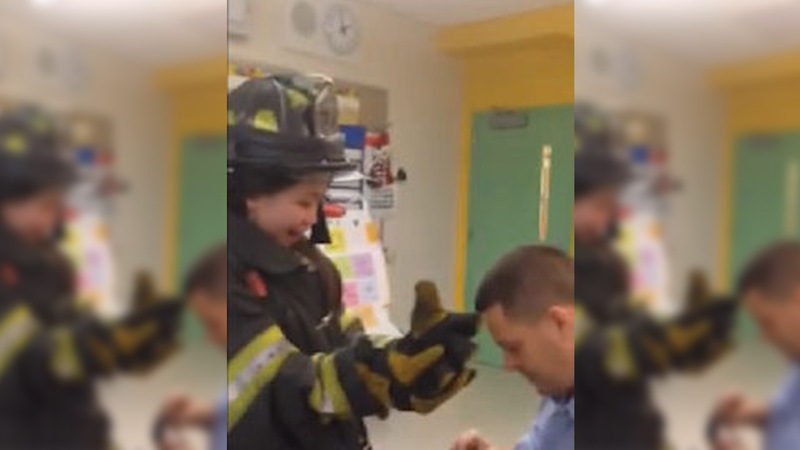 WOODSIDE, NY -- An FDNY firefighter's sweet proposal to his teacher girlfriend was caught on camera during a fire safety lesson at the Queens school where she works. Lieutenant David Royael, of Engine 243 in Brooklyn, got down on one knee on December 23 at PS 361 in Woodside, on the last day of school before Christmas break. He first dressed his now-fiancee, kindergarten teacher Natalie Moy, in his oversized bunker gear while the students laughed at the sight. But he had secretly hidden the ring box in one of the gloves. When she took the glove off and the box fell into her hand, Royael dropped to the ground and popped the question. Moy has been a teacher for 14 years, while Royael is a 13-year veteran of the department. They have been together for two years.